The city, citing the long-time space vacancies as well as unfair competition to private – and unsubsidized – businesses along the street, refused any new commercial tenants. Mendez was caught up in what had been the biggest downtown controversy in some years as certain downtown boosters wanted to save the retail garage function to encourage more businesses and pedestrian traffic. “I put in a bid, I was the only person who put a bid,” he said. In any case, the space was converted, Mendez lost out but has resurfaced nearby and in almost spectacular fashion. “Everything happens for a reason,” he says. 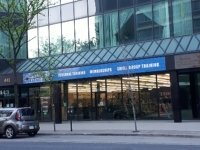 He has moved literally around the block to 443 Ouellette, a 1970s era black office building known for its large angled glass façade and which used to house a Shoppers Drug Mart. “I wanted that spot after I was denied the Pelissier parking garage,” he said. He now has “a better location,” 8000 sq. ft. on the first floor of the building, which passersby can easily look into and see is a gym. In the one year he’s been there – he also has a similar size studio on Tecumseh Rd. E. – he has signed up 325 clients including 70 people at increased price memberships for personal training. “It’s growing for sure,” he said. Mendez said he wanted to do business downtown because he saw no other “private” facility serving office people and residents in the city centre. There is a public workout facility at the city-owned aquatics centre but doesn’t offer the array of services, especially providing one-on-one training. “There’s nothing in the downtown core that focusses on the service that I focus on, personal training,” he said. Downtown business people, city hall workers, lawyers, students. He also has a pro shop to sell supplements and nutrition shakes and will soon be opening a massage therapy studio. Mendez said personal fitness training is proving to have wide appeal. “I call it Cheers without the beer,” he jokes. Despite being turned down for the Pelissier St. garage he says, “I don’t have any ill feelings” and noted some critics of the city’s move were “much more upset than I was” though he does think the city isn’t going about downtown revitalization the right way. But Mendez has surely found a silver lining on the city’s main drag, a building also shared with a couple of legal aid clinics, which also moved there relatively recently.